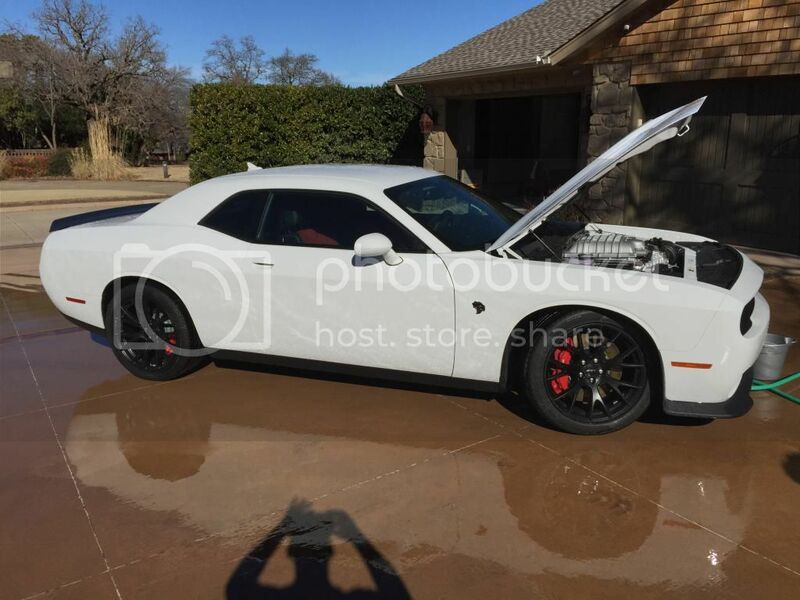 13 SRT8, FORGED 426 STROKER, D1 PROCHARGER, MCLEOD CLUTCH, DSS LEVEL 5 AXLES, DSS DRIVESHAFT, BARTON SHIFTER, UPGRADED FUEL PUMP, ARRINGTON CATCH CAN, SEQUENTIAL LIGHTS, FORGELINE SP3S 20x9.5/10 WHEELS, MOPAR STAGE ONE LOWERING SPRINGS, AEM BOOST & AFR GAUGE, RE PILLAR POD, RE STRUT TOWER BRACE, 675 RWHP/644 TQ. Last edited by B&R Challenger; 01-29-2015 at 12:32 PM. Sublime/A8/Laguna Black leather/summer tires/Audio upgrade. Purchased 2-2-15 at Rouen Dodge, Woodsville Ohio. Story goes that someone ordered this car with a M6, car arrived with an auto........guy says he don't want it now. The dealer says they called dodge & dodge said too bad keep it....lol. MSRP was 65,870. When I got there they informed me of the 10K market adjustment.....I informed them that I wasn't interested. They said "how about a 5K market adjustment", I declined again and was fully prepared to walk. We settled on 2K over MSRP. I will fully admit to paying more than its worth but I couldn't let it slip, everything I wanted and no waiting involved. I left the dealership at 10:30PM, drove it 8 miles on snowy roads till I hit the turnpike & had most of the drivers laguna leather seat sucked up tight....LOL, surprised i didn't stroke out! Most of the freeways were clear from then on but I couldn't stretch its legs much. It got me and my 8 year old son home no problem though. It was a very memorable trip for us, great times. Got home at 12:30AM, (school night/work night mind you) parked the car, got out to open my garage door which was frozen.......broke the garage door.........cleared a spot for the car and proceeded to get 100% friggin STUCK 10 feet from getting in....LOL. Thankfully my neighbor heard all the "noise" & came to my rescue. A little shoveling & finesse got the "cat" safely in its box. Wont forget that night EVER....best thing ive ever blown this much money on that didn't disappear up my nose. I wasn't around for the first Hemi era.......im not missing this one. Last edited by DB2; 02-03-2015 at 09:11 PM. Waiting for the weather to clear so I can pick up my new Bright White 6 speed Hellcat waiting for me in Las Vegas. Driving from Utah. Snow today but tomorrow's forecast is clear and sunny. Well I got my Hellcat from Caitlin of Philadelphia in Jenkintown on old york road. Order date was 09/24/14 received on 02/24/15. Just passed the 500 mile mark. Last edited by yellowjacket; 03-15-2015 at 10:35 AM. Order Date 1/9/15. Delivered 3/17/15 From Expressway Dodge, Evansville Indiana. 770 miles from Dallas. I think she's kind of broke in now. 2015 Dodge Challenger Hellcat. Torred Red with brass monkey wheels, Auto, Nav. Last edited by firetruck; 03-19-2015 at 08:33 PM. Picked it up in St. Louis on March 20th. (South county dodge) Drove her home back to Fargo, North Dakota. Would not highly recommend this dealership. Maybe it was because i was from out of state but their communication was terrible. Id call and get nothing but voicemails. They would never return my call until closing time when they had no time to talk. When spending 70k I'd like to feel a little more appropriated. When i did talk to them they said oh sorry we have been swamped with customers. Well....aren't I a customer? However when I finally got there. The whole time i was there i didnt see a single other customer. Makes me wonder how busy or lazy they really were. Anyway glad THE HULK is home. Just some concerns with the blower whine other than that i love it. Last edited by bighit2883; 03-23-2015 at 06:23 AM.